GeoCities, MSN Messenger, Winamp – if you don’t know the meanings of these words then you probably aren’t old enough to remember the silver age of the internet. A time when you could only go online in the evening because during the day it cost an absolute ton, and not at the same time as your mum was on the phone because there was one phone in the house and it was attached to a table or the wall. If all of this sounds like complete nonsense then you were probably born about five minutes ago and don’t recall the glory days of dial-up, and I’m now probably older than your mum. Back in the day, when I were a lad, we didn’t watch Netflix for 18 hours straight. YouTube wasn’t even a thing. But there were weirdly satisfying creepy videos to watch. And oh how we spent our afternoons between playing football outside and watching The Simpsons for six hours straight. One such piece of WTF internet content on the same level of tell your mates about it at school because you didn’t have interweb capable mobile phones to show them on, was Salad Fingers. 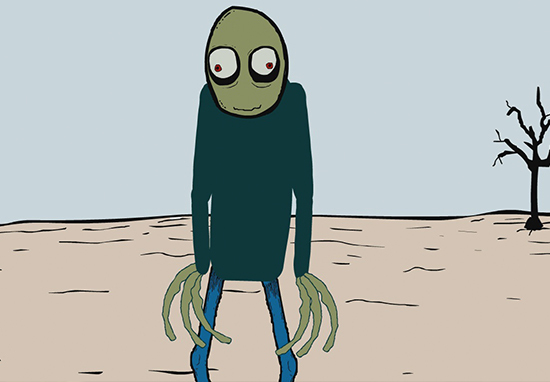 It’s been 14 years since Salad Fingers first appeared and this week, its creator has uploaded a new video to YouTube, to celebrate 1,000,000 subscribers to his channel. First conceived as an in-joke when Yorkshire animator David Firth’s friend commented while playing guitar he had ‘salad fingers’. Salad Fingers is a tall, bald and emaciated chap whose only friends are finger puppets. Sweet and lovable, fan theories suggest he’s either survived a nuclear war or is a cannibal. One theory states that Salad Fingers is a cannibal, and is either denying it, or is oblivious to the fact. Salad Fingers is believed to suffer from multiple personality disorder, and that Hubert Cumberdale (one of his finger puppets) was his true personality, and SF was just Hubert’s gentle and oblivious side. The theory also notes SF’s obsession with a substance that he believes is rust. You see, rust is closely related to blood, right down to its taste, iron content, and color, which adds credibility to the theory that Salad Fingers’ alter-ego, Hubert Cumberdale, is obsessed with blood. This theory also implies that Salad Fingers may not even know what blood is, but states that he loved it in Episode 2 of the webseries, stating that he loved it when the red water came out of him after he had pricked one of his fingers on a hanging nail. The theory also suggests that Salad Fingers wears the skins of his victims as a reference to the serial killer Buffalo Bill from The Silence of the Lambs. The War Theory comes from Salad Fingers references to the war, but details of what the war was, when it was and how it started aren’t explained. The nuclear ending theory kind of makes sense if you consider Salad Fingers’ appearance, characteristics and finger puppet friends. Another War Theory is the Great War was the First World War and Salad Fingers lives in an alternate reality where ‘the war to end all wars’ was in fact a war that ended all wars. This is supported by Salad Fingers saying to Kenneth’s corpse in episode seven ‘Back to the trenches with you’. The Film Theorists approach has racked up almost 10 million views on YouTube, however David Firth has dismissed their theory. I just think he’s a great guy.